Mustard never ceases to remind me of my dadi. She’d grow it in a tiny balcony when she first arrived in London and occasionally in plastic terracotta pots in the shed. No corner of the garden went untampered by her green fingers. Like coriander, mustard is a hearty, headstrong herb that pretty much takes root and grows in abundance wherever you put it. I’m sure I’m completely wrong and my gran will say that there is a technicality to it but she makes it look so easy! Today’s recipe is one inspired by the Bengali obsession with mustard. The seed, the oil, the colour. Give it to us any which way and it will be a welcome sight! 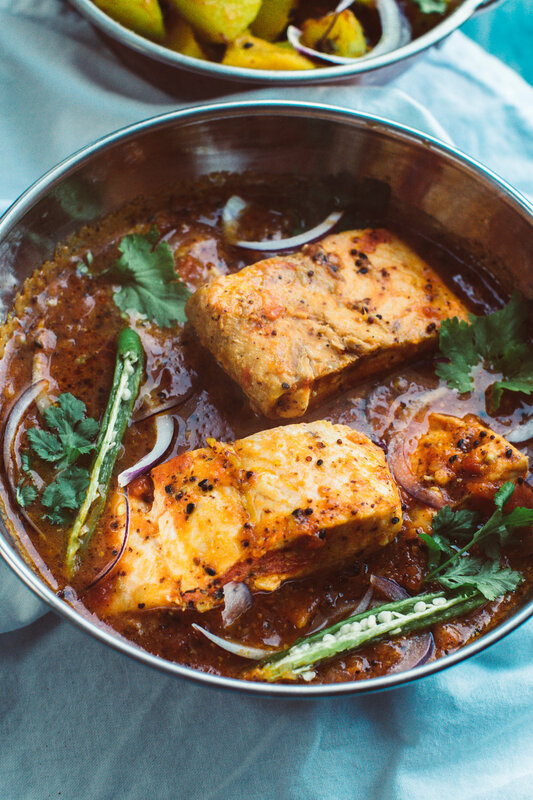 This is shorshe salmon: hefty chunks of salmon simmered over a black mustard and tomato jhol. No onions necessary (although I couldn’t resist sprinkling a few on top!) It’s a very easy twist on the shorshe maach which is usually made with regional fish like Hilsa, commonly know and ilish. Fillet and slice salmon into hefty strips (at least 3 inch wide). Boneless fish often disintegrates while being cooked so bigger is better! Using a pestle and mortar, crush black mustard seeds until they are finely ground. Add to the the ginger, garlic and chilli. Heat a non-stick deep pan and temper the mustard oil. If you want, you could mix with vegetable oil to prevent the mustard oil from smoking up the entire kitchen with a fiery fog. I personally live for it! Once the oil is sufficiently hot and runny, lightly fry off your mustard paste for 2-3 minutes. Pulverise your tin of tomatoes with a fork before pouring it into the pan. Bring the tomatoes to a low simmer for 10 minutes, stirring occasionally. Finish off your masala with a smattering of salt and pepper. As onions are not involved in this shorshe fish dish, the process of cooking speeds up tenfold! Finally add the salmon chunks to the mustard and tomato masala and leave on a low heat for another 10 minutes. Occasionally ladle a few spoons of the masala across the top of the salmon to make sure both sides are equally flavourful. Do not, by any means, disturb boneless fish by attempting to flip them! It will probably result in a flaky mess. 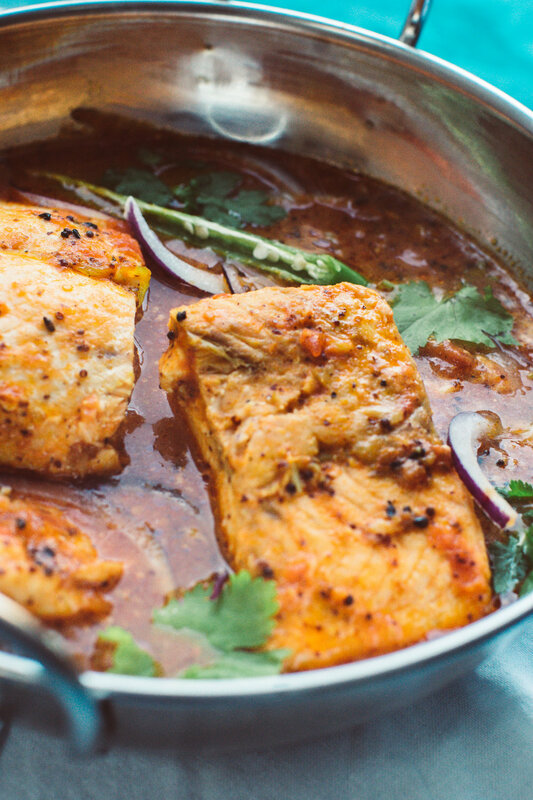 Remove salmon and plate up before spooning over the masala. It tastes great on its own for a light lunch or served with jeera rice.